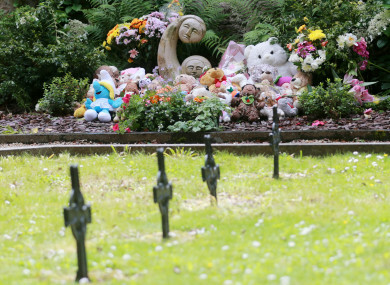 THE CATHOLIC CONGREGATION which ran the Bessborough mother and baby home in Cork has claimed it does not know where the bodies of more than 800 children connected to it are buried. Today fifth interim report of the Mother and Baby Homes Commission of Investigation, chaired by Judge Yvonne Murphy, was published. In it the commission said the affidavit provided by the Congregation of the Sacred Hearts of Jesus and Mary was “speculative, inaccurate and misleading”. More than 900 children died in Bessborough or in hospital after being transferred from this home. The commission said despite extensive inquiries and searches it has been able to establish the burial place of only 64 of these children. The congregation has stated it does not know where the other 836 children are buried and provided “very little evidence” to support the statements made in its affidavit, according to the report. The commission has also established that the burials of children who died in the three Sacred Heart homes – Bessborough, Castlepollard and Sean Ross – are not recorded at all. The commission said it finds it “very difficult to comprehend” that the congregation does not know where the children who died at Bessborough are buried. One member of the congregation who was in Bessborough for most of the period 1948- 1998 told the commission that she did not remember any child deaths during her time there but she implied that the children who did die there were buried in the congregation burial ground. In the years 1950-1960, 31 children died in Bessborough. Today’s report points out “it is rather surprising that she does not remember any deaths”. Another member of the congregation who was there in the 80s said there were two children buried in the small graveyard where members of the congregation are buried. And one nun who was in Bessborough in 1971 and then again between 1975 and 1981 said she remembered one child being buried in this graveyard. The commission found the recollections of these two congregation members “seem to be incorrect”. In fact, it would appear that there is only one child buried in the congregation’s burial ground and that burial took place in 1994. The burial ground has some individual memorials to other children who died in Bessborough but it is unlikely that they are buried in this plot. Where could they be buried? The report said it is unlikely that all the children who died in Bessborough were buried in this burial ground as it is not nearly large enough for the number of children involved. It is possible, it said, that children are buried within the grounds which measure 60 acres, or in grounds that no longer form part of the estate – a total area of 200 acres – but there is no evidence of systematic burial anywhere other than the small burial ground. The commission found that while it is “highly likely” burials did take place on the home’s grounds, it is not feasible to excavate 200 acres of land. In the period between the opening of the home in 1922 and March 1929, 54 children who died in Bessborough were buried in St Joseph’s Cemetery, which was owned by the Society of African Missions (SMA). The congregation paid the SMA ten shillings for the burial of each child in the “poor ground” section of the cemetery. It then recouped the cost from the health authority responsible for each child’s maintenance. The commission said the abrupt cessation of child burials at St Joseph’s in June 1928 may have had something to do with costs. “If these deaths had occurred in Cork County Home, or Cork District Hospital, the South Cork Board would have arranged burials in its burial ground, the Cork District Cemetery at Carr’s Hill, at no additional cost to the local authority. Considering that the next identifiable burial place of a Bessborough child is at this burial ground, in 1960, it seems plausible to suggest that the remains of unclaimed Bessborough children who died between June 1928 and 1960 may have been buried by the South Cork Board in Cork District Cemetery, Carr’s Hill. However, the commission has been unable to find any direct evidence of this. One child was buried in Cork’s District Cemetery, Carr’s Hill in 1960. The mother of the child buried in Carr’s Hill was told by the congregation in 1994 that her child was buried in the Bessborough burial ground. There were 113 Bessborough children who subsequently died in Cork District Hospital/St Finbarr’s Hospital. A former administrator at the hospital confirmed to the commission that the South Cork Board of Assistance assumed responsibility for the burial of these children and that many are buried in Carr’s Hill. However the commission has been unable to confirm this. The Commissions’s report said the identification of children in St Joseph’s burial records is “interesting” as it demonstrates the congregation assumed responsibility for the burial of children who died in Bessborough. It also shows that those infants were not buried in the grounds of Bessborough but were buried in a number of different locations. Between November 1927 and January 1985, 12 adult women, all former residents of the Bessborough Home, were buried in a congregation-owned burial plot at St Joseph’s Cemetery. This plot is marked by a headstone which lies broken in three pieces. The inscription is unreadable but Judge Murphy said it is unlikely that it bears the names of women buried in the plot. The women buried here remained in Bessborough for extended periods working as domestic servants; their deaths were not childbirth related. One woman entered Bessborough in 1922, aged 20 years, and remained there until her death in 1984 – a period of 62 years. Another entered Bessborough in 1924, aged 21 years, and remained there until her death in 1985 – a period of 60 years. The commission has not been able to establish the burial place of these 14 women. Six were private patients. Eight mothers were public patients; two of these died in Bessborough, five in Cork District Hospital/St Finbarr’s and one in Dungarvan County Home. Judge Murphy said it should be noted that several hundred neo-natal deaths during the period under review were recorded among “legitimate” children born in or admitted to Cork District Hospital/St Finbarr’s. The commission identified hundreds of burial records relating to these “legitimate” children who died there. Of the 552 “illegitimate” children who died in Cork District Hospital/St Finbarr’s, (including 113 transferred from Bessborough), the commission has identified the burial place of only five. Between 1922 and 1998, a combined total of 1,343 “illegitimate” children died; 771 died in Bessborough; 552 died in St Finbarr’s Hospital and 20 subsequently died elsewhere. To date, the commission has identified the burial places of just 64 children. “Despite having undertaken an intensive investigation the burial locations of 1,279 of these children remain unknown,” the report said. Minister of Children Katherine Zappone earlier made an appeal for those who know where the remains of these children are to let the commission know. Email “Bessborough nun claims she doesn't remember any child deaths - there were 31 during her time there”. Feedback on “Bessborough nun claims she doesn't remember any child deaths - there were 31 during her time there”.